Meet Christian from the Customer Transport Team. Meet Christian from the Customer Transport Team. Christian has worked at the airport for 18 years and for the past 7 as one of our Bus Drivers. I started out on a 6-month temporary contract and was crossing my fingers to be kept on, I have now been here 18 years and worked as a Bus Driver for the last 7. I really enjoy the variety of duties working in the Customer Transport Team – no two days are the same, especially with the transformation project happening at the airport. Recently, I completed training to be able to support new Bus Drivers when they join the team and it’s great to have a variety of tasks. My favourite part of the role is working Airside as it reminds me that I’m working at the airport! 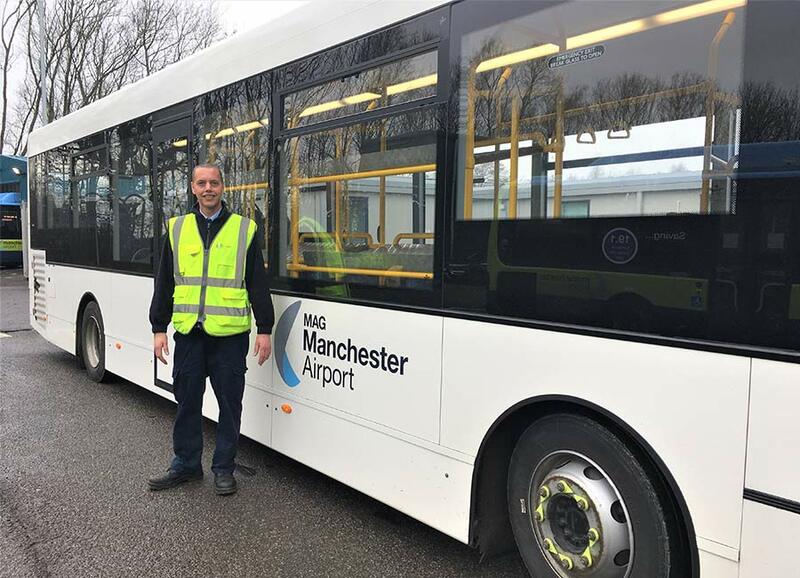 What is it like to work at Manchester Airport? Fantastic - MAG care about the well-being of their staff. It’s a good salary for the role, and there is an annual bonus scheme, you get a pension as well as other staff benefits. You meet different people every day, whether it is staff or passengers and I work in a great team at present, everyone is always willing to help each other when things get busy. Bus Drivers begin by completing a required changeover with another Driver to ensure the service always stays in operation as well as conduct vehicle checks where necessary. The foundation of the role is to pick up customers from specific car parks, take them to terminals and vice versa. I always ensure I am compliant in every task I do to follow domestic driving regulations, whilst putting the needs of the customer first. I still need to maintain flexibility to meet the operational needs meaning tasks could change at a moment’s notice. This is great as it keeps the role varied, challenging and means we can continue to deliver a high standard of customer service to guests. What advice would you give to anyone aspiring to work at MAG as a Bus Driver? Go for it! If you are flexible and looking for a fast-paced role then apply. You need to be calm, patient and self-aware – passenger’s safety is in your hands. Be prepared to work some unsocial hours, meet a variety of people and be recognised for the work you do!